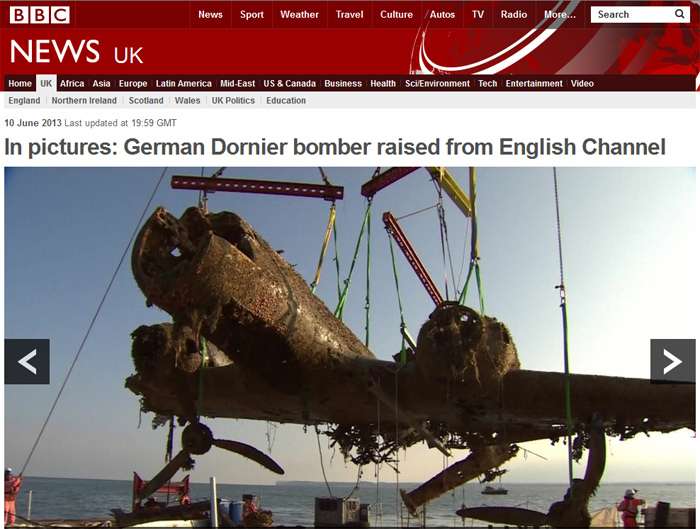 BBC is reporting that a German Dornier Do-17 bomber from WW2 has been raised from English Channel. Experts believe the German plane is the last remaining intact Dornier Do-17 bomber in existence. However parts of the fragile wreck of the plane are missing and the fuselage was damaged when it was shot down on 26 August 1940. A spokesman said the lifting operation had been an “absolute success” and the aircraft “looks great”. The Dornier will now be restored before going on display at the RAF Museum in Hendon, north London. The Dornier Do 17, sometimes referred to as the Fliegender Bleistift (“flying pencil”), was a World War II German light bomber that was designed as a Schnellbomber (“fast bomber”), a light bomber which, in theory, would be so fast that it could outrun defending fighter aircraft. The Dornier was designed with two engines mounted on a “shoulder wing” structure and possessed a twin tail fin configuration. 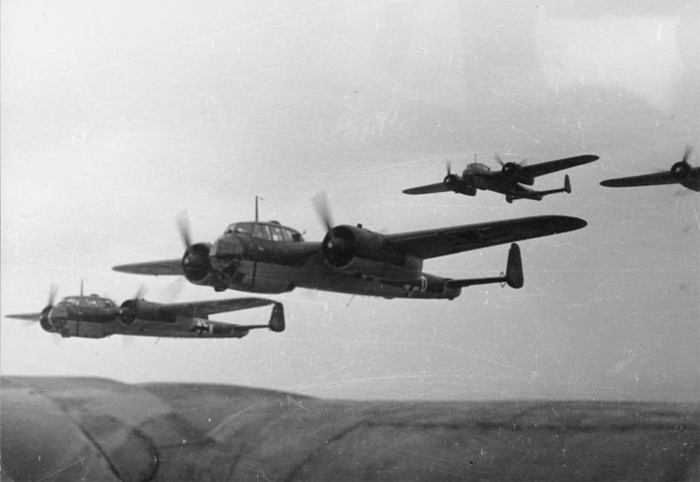 The type was popular among its crews due to its manoeuvrable handling at low altitude, which made the Dornier capable of surprise bombing attacks. Its sleek and thin airframe made it harder to hit than other German bombers, as it presented less of a target. Designed in the early 1930s, it was one of the three main Luftwaffe bomber types used in the first three years of the war. The Do 17 made its combat debut in 1937 during the Spanish Civil War, operating in the Condor Legion in various roles. Along with the Heinkel He 111 it was the main bomber type of the German air arm in 1939–1940. The Dornier was used throughout the war, and saw action in significant numbers in every major campaign theatre as a front line aircraft until the end of 1941, when its effectiveness and usage was curtailed as its bomb load and range were limited. Production of the Dornier ended in the summer of 1940, in favour of the newer and more powerful Junkers Ju 88. Few Dornier Do 17s survived the war and the last was scrapped in Finland in 1952. Nice article and some very good pix. That said, I must question your use of the word,’ intact.’ At best, ‘recognizable,’ is the most that one can say for this recovered airplane. Considering the advanced state of decay, one has to wonder why it was raised/recovered in the first place. To call it ‘intact’ is more than a bit silly.